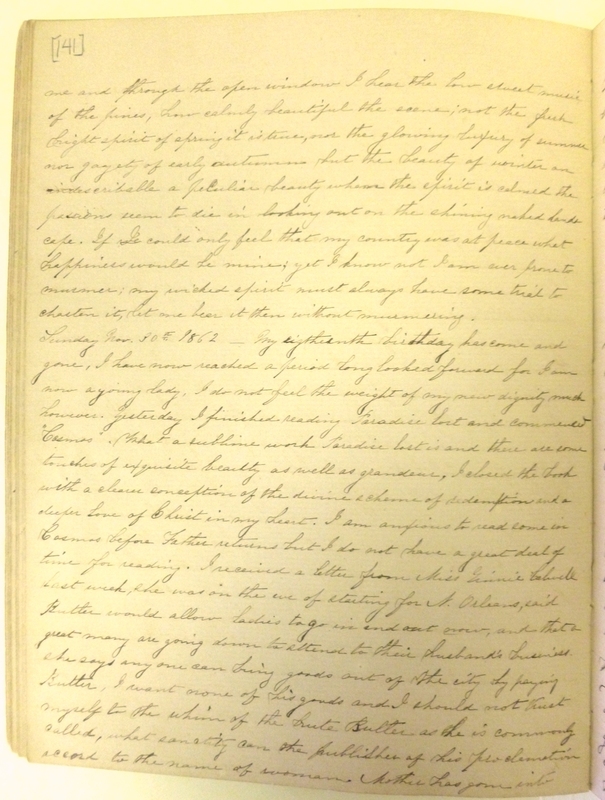 Item description: Entry, 30 November 1862, from the diary of Sarah Lois Wadley. My eighteenth birthday has come and gone, I have now reached a period long looked forward for I am now a young lady. I do not feel the weight of my new dignity much, however. Yesterday I finished reading Paradise lost and commenced “Cosmos”. What a sublime work Paradise lost is, and there are touches of exquisite beauty as well as grandeur, I closed the book with a clearer conception of the divine scheme of redemption, and a deeper love of Christ in my heart. I am anxious to read some in Cosmos before Father returns, but I do not have a great deal of time for reading. I received a letter from Miss Ginnie Calwell last week, she was on the eve of starting for N. Orleans, said Butler would allow ladies to go in and out now, and that a great many are going down to attend to their husband’s business. She says anyone can bring goods out of the city by paying Butler, I want none of his goods and I should not trust myself to the whim of the brute Butler, as he is commonly called. What sanctity can the publisher of his proclamation accord to the name of woman. Mother has gone into Trenton this evening to see Mrs. Cauthorn, who was thought to be dying last week, and is still very ill indeed, she has a young baby, I hope she may be spared for her children’s sake. We are having delightful weather now, this morning it was very damp but has cleared off now, and the wind is blowing the leaves in whirlpools around the yard. We have had no war news for some time. 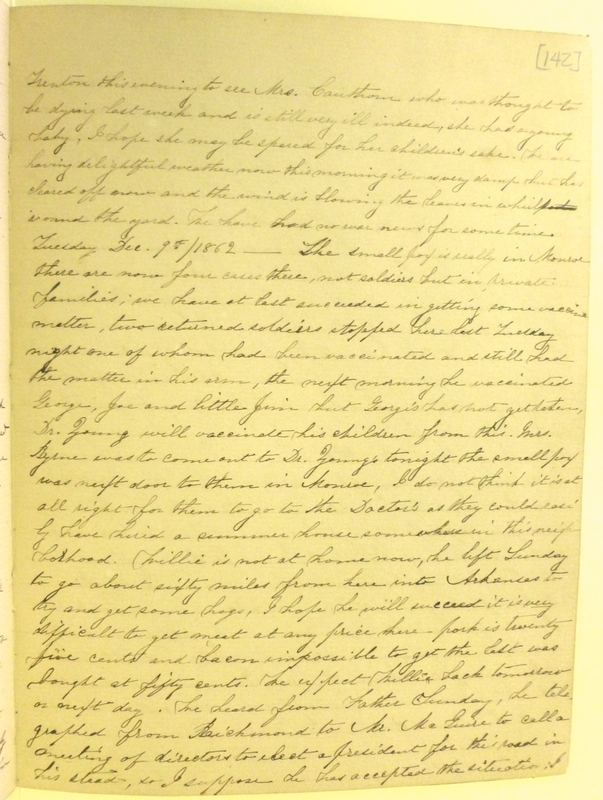 This entry was posted in Southern Historical Collection and tagged diaries, General Benjamin Franklin Butler, home front, New Orleans, reading, Sarah Lois Wadley, women. Bookmark the permalink.